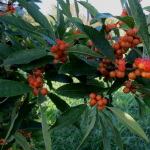 ILEX verticillata ‘Aurantiaca’ 6’ (Zone 4)Northern type dwarf, distinctive for fruits that change from red to an attractive golden orange. “Aurantiaca” (a-RON’-ti-A-kah) is a Latin adjective meaning orange in color. 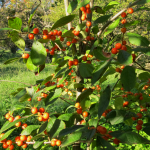 ILEX verticillata x serrata ‘Bonfire’ 15’ (Zone 5)(Simpson selection and introduction) A superior selection with masses of small red fruits, Coloring earlier in the fall while the leaves are still green. 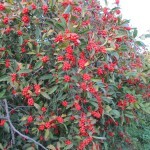 Makes a tall shrub to 15’, with Slender branches that droop with the weight of its fruit. Small plants fruit heavily. Pollinators: Apollo and Southern Gentleman. 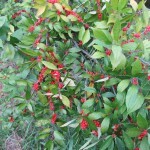 ILEX verticillata ‘Cacapon’ 7’ (Zone 4)Slower growing type similar to Afterglow, somewhat more upright. Very heavy fruiting with smaller, true red fruit. A native selection of Dr. O.M. Neal, University of West Virginia. The name “Cacapon” (kah-KAY’-pon) is a Native American word referring to “healing waters”. 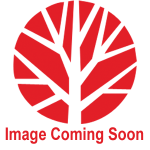 ILEX verticillata ‘Golden Verboom’ Female 4’ (Zone 3)ILEX verticillata ‘Golden Verboom’ MaleNOTE: Unless one has a wide variety of Ilex verticillata males on hand, ‘Golden Verboom’ females require their own ‘Golden Verboom’ males to assure pollination. Selected at Verboom Nursery in Holland for use specifically as cut branch, this cultivar produces bountiful masses of bright, large, truly yellow fruit which last into winter. 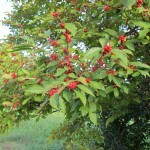 An excellent landscape cultivar either grouped or contrasted with red fruited cultivars. 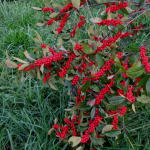 ILEX verticillata ‘Red Sprite’ 4’-6’ (Zone 4)The most dwarf of winterberries, with the largest fruit. 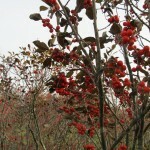 Slow growing, broader than tall, bright red abundant fruits to ½” on very short stems. Leaves are broad, oval and small. (This plant has been offered for years as ‘Nana’ before being given a registered name.) Pollinators: Apollo and Jim Dandy. US National Arboretum. A little slower to fruit and slower to defoliate than other cultivars. Styer Award of Garden Merit Winner – 1988. Pollinators: Apollo and Southern Gentleman. ILEX serrata x verticillata ‘Apollo’ 12’ (Zone 5)A male selected by the US National Arboretum to accompany Sparkleberry. Growth is vigorous. Selected for its consistent, abundant pollen production. 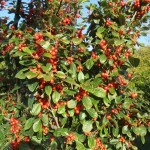 ILEX verticillata ‘Jim Dandy’ 5’ (Zone 4)(Simpson selection and introduction) Formerly called “Dwarf Male” and sometimes called “Early Male”, this is the male pollinator for all northern types, slow growing winterberries. It blooms heavily over an extended period. 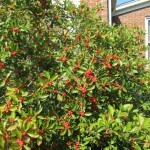 ILEX verticillata ‘Raritan Chief’ 6,-9’ (Zone 5)Low, with a compact and broad growth habit. Good green foliage color that’s retained throughout the growing season.